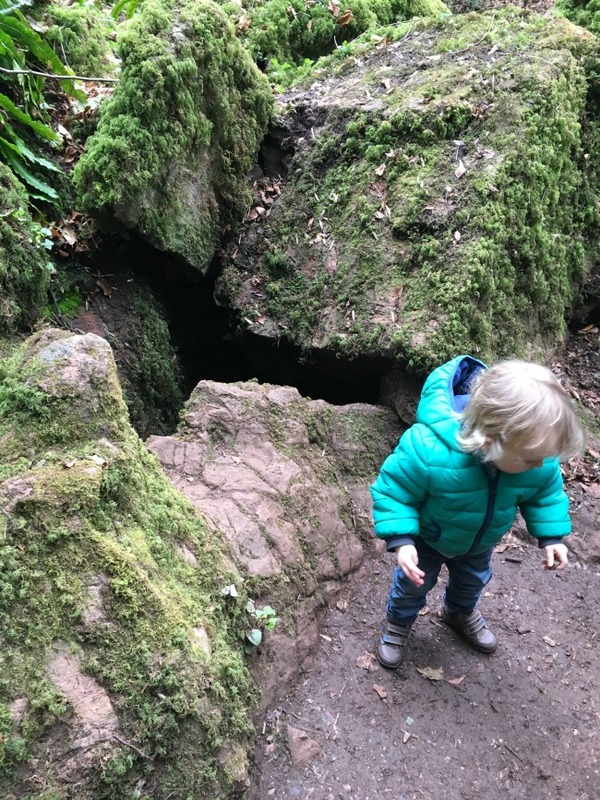 I was lucky to meet Helen at Traverse16, a bloggers conference, and she invited me and Bear to visit her magical woodland at Puzzlewood in the Forest of Dean. 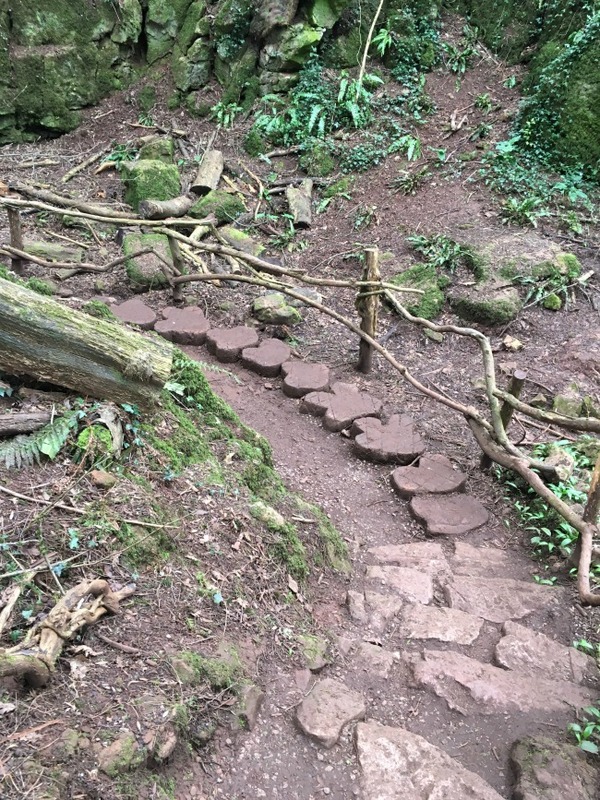 Puzzlewood* is a fantastic place for children of all ages, from toddlers to big kids! 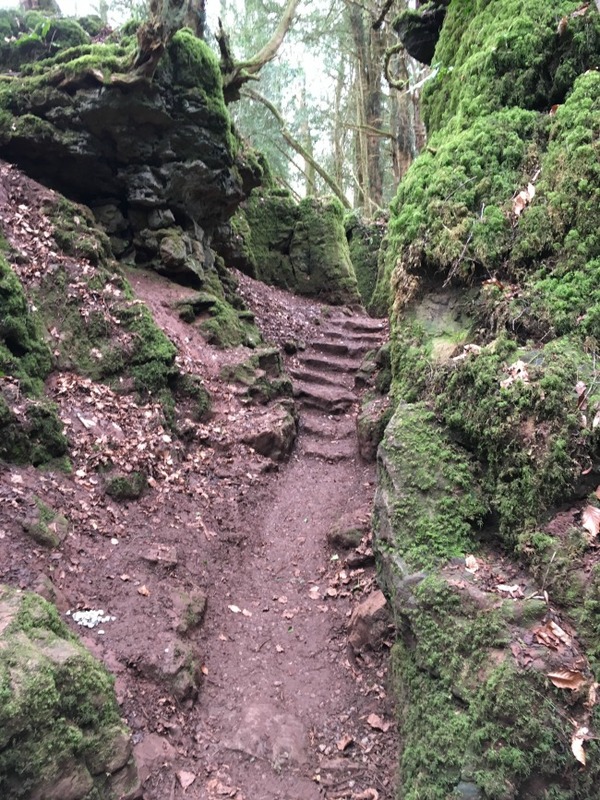 You may not have heard of Puzzlewood in the Forest of Dean. 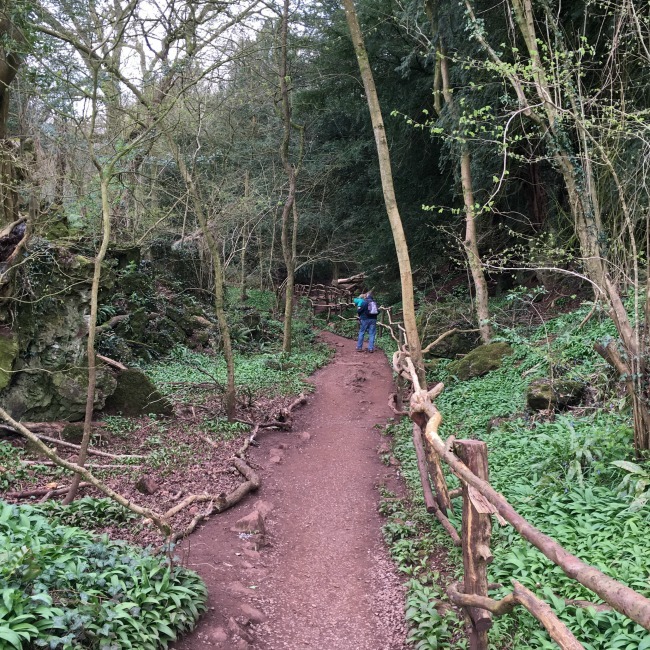 It is a little piece of magic just outside Coleford, just 50 minutes from our home in Cardiff. When you see our pictures I am sure it will look familiar. It has been used as a set for films and TV. Merlin, Star Wars, Dr Who, Atlantis, Jack the Giant Slayer, Hidden Kingdoms are just a few. 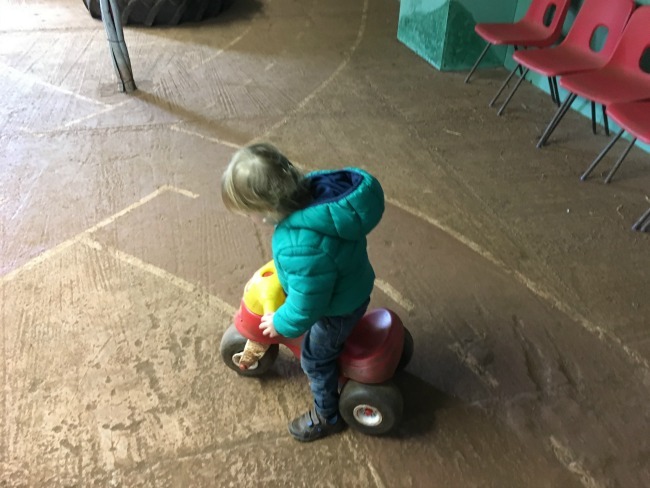 What's there for a toddler? 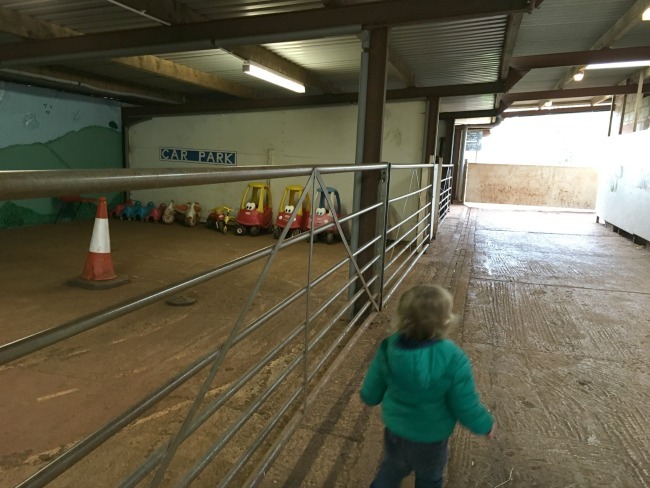 Animals, a toddler race track, indoor maze, willow maze, treasure hunt and the wood. 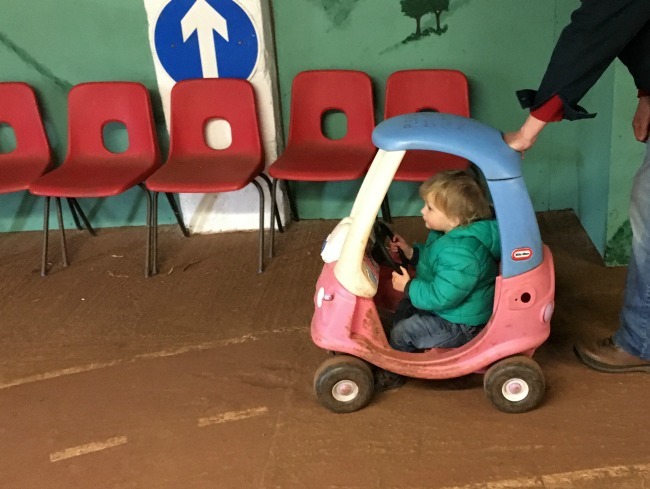 It's not suitable for buggy's so be prepared to carry your little ones a bit. We decided to follow in famous footsteps and make our own documentary. OK it's still pictures and a bit blurry in places but here is. 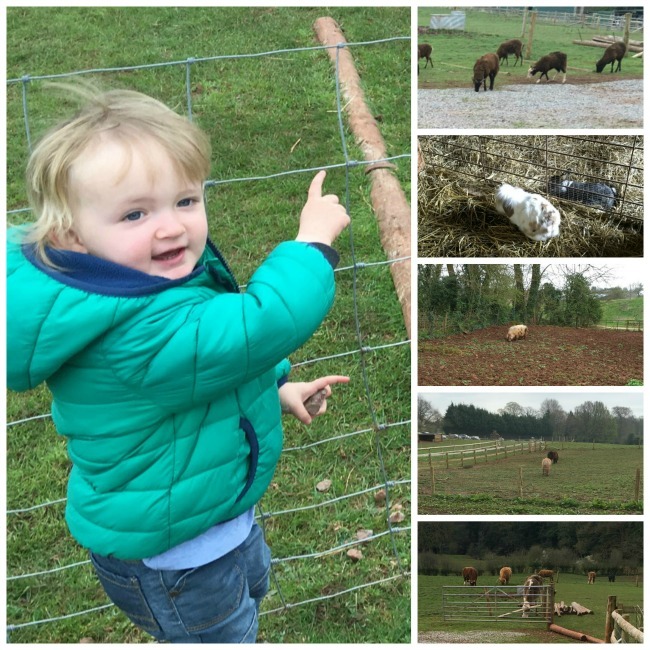 We started our visit looking at the animals. Bear loved them and was able to mimic them all. A snort for Lucy the pig, an eeore at the donkeys, moo to the cows, baa at the sheep and twitchy nose at the rabbits. We then went looking for the race track, it's inside so even if it's raining the race will go ahead. There is a figure of 8 track and lots of different foot powered cars to ride. We were the only ones there. 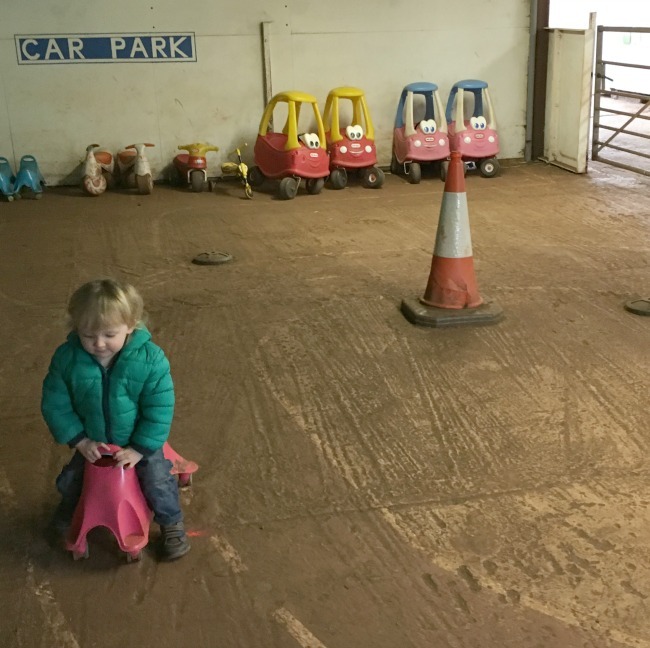 The other visitors were a little bit bigger so Bear had the track to himself, which meant he could try every car...yes, every one. We could hear children having fun in the maze next door but decided to go to the wood while Bear was still full of energy. 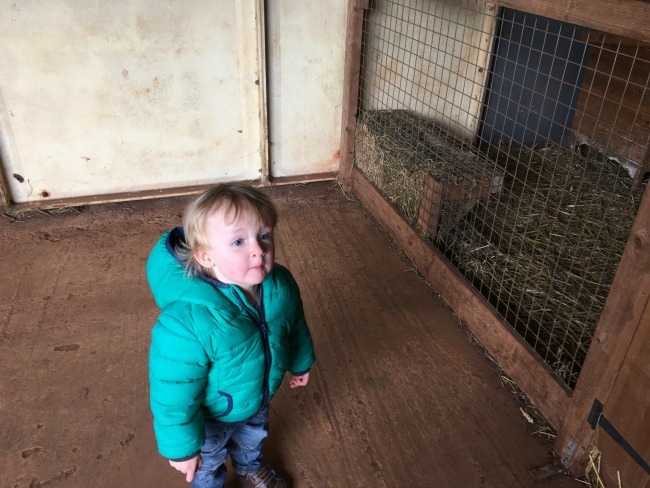 We were a little apprehensive at first, what if it wasn't suitable for him? What if there were big drops and lots of water and other hazards? We needn't have worried. 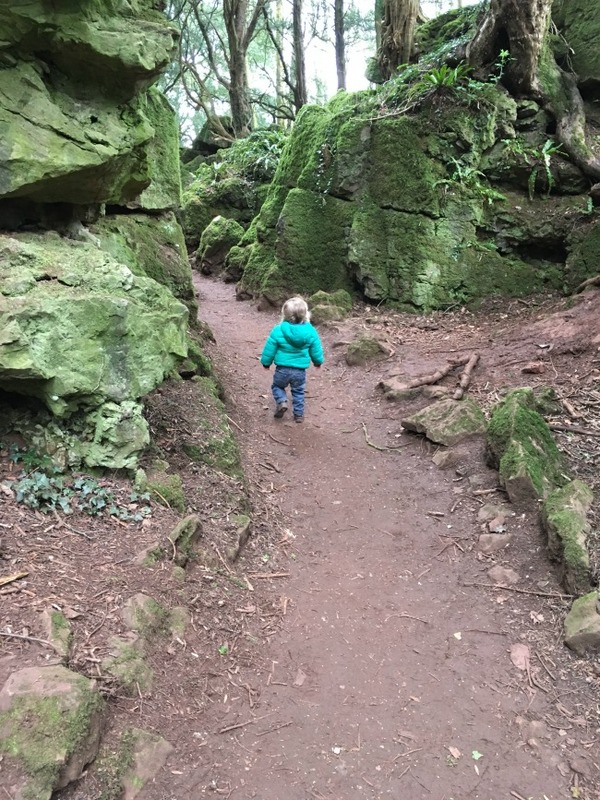 After a little carry Bear was off exploring the delights of Puzzlewood. A magical place to explore. What will Bear find? Behind you! The cave is behind you. 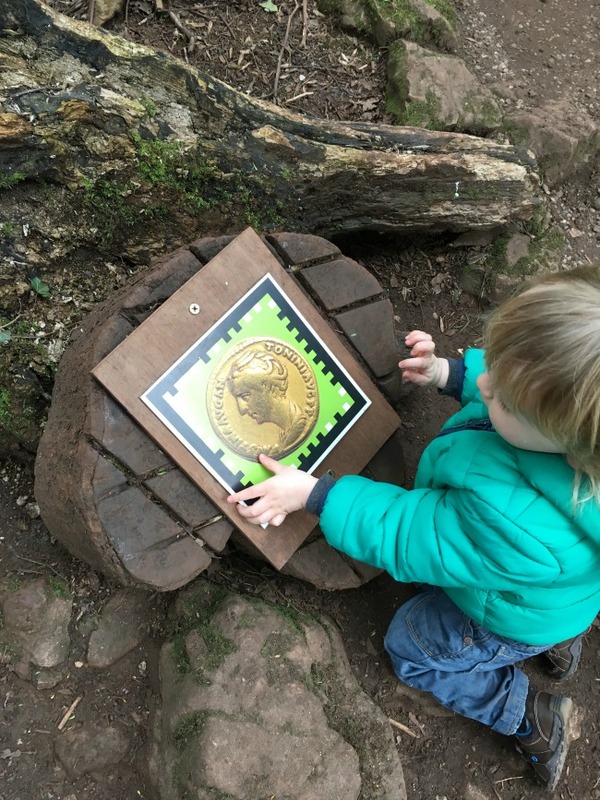 Throughout the wood there are Roman coins to "collect". You need to download the free app from the app store first and have an iPhone. We just liked looking at them all. Bear wanted to collect them for real. Ahh treasure, I'll have this. And then he found a crocodile seat, not just any old seat but a bouncy one. Grandad bounced and Bear loved it. Bear still exploring even when he's taking a minute to rest. We found caves and secret doors and got "lost". 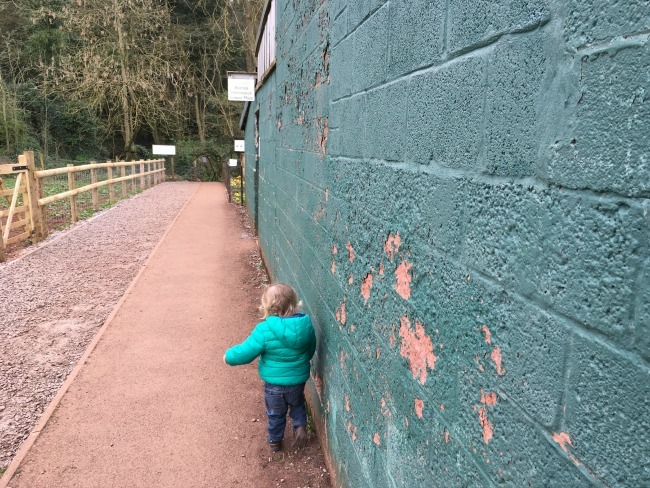 Without a toddler you can't really get lost but we didn't want to walk too far and have to carry him all the way back. The route is also marked by little piles of stones.We enjoyed it so much we didn't realise we had been walking for an hour. After our walk around the wood we stopped for a picnic. There are lots of picnic tables, some are inside which would be good on a rainy day. There is a cafe and shop too. 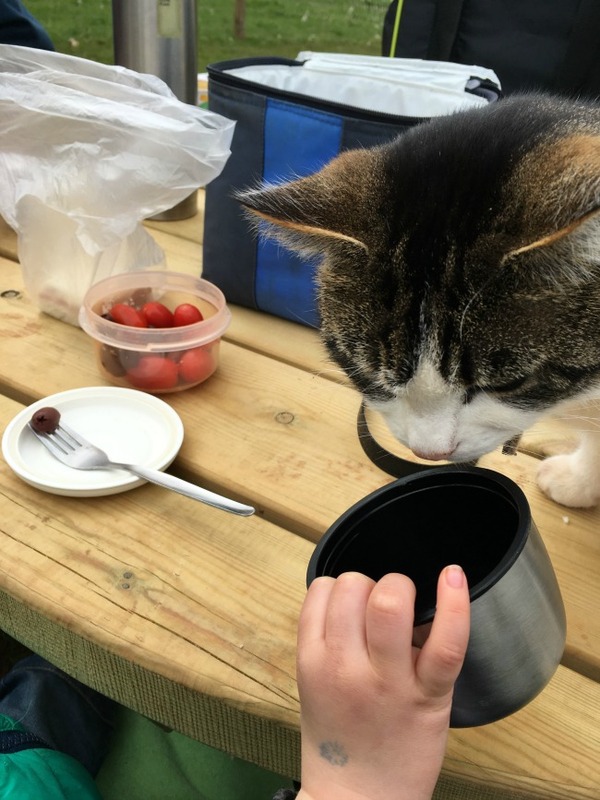 But how could we resist a picnic when we had this little chap as a guest? Bear sharing his milk with a really friendly cat. There's also a play area with a sandpit and lots of benches to rest your weary legs. 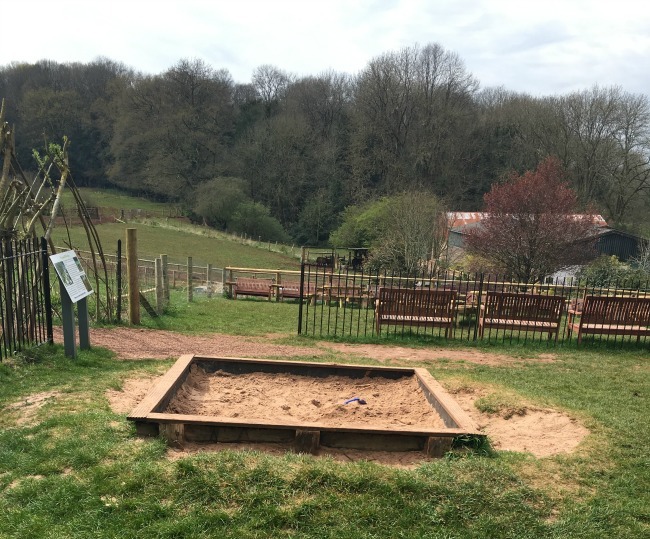 The sandpit and playground is right next to one of the picnic areas. 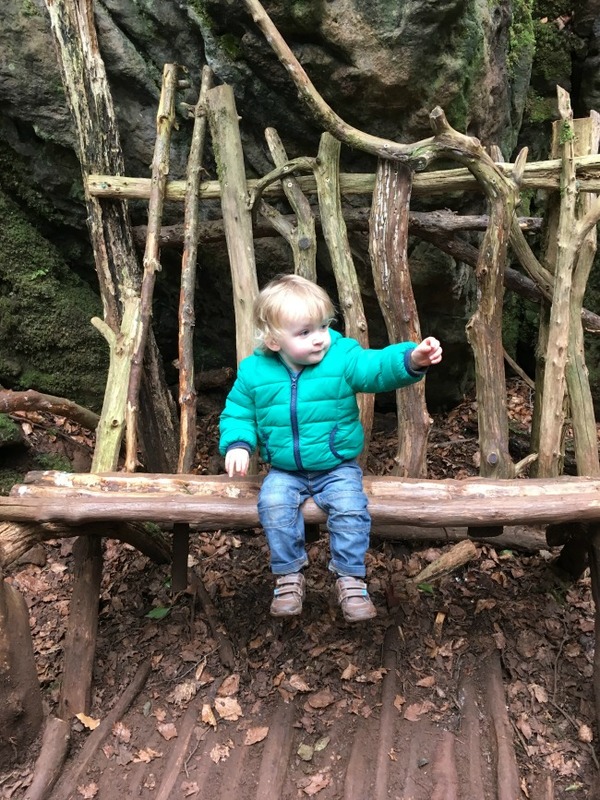 Bear loved the willow maze, I didn't get a photo of him in it but he just laughed and ran around. It must be great in the summer when it's covered in leaves. 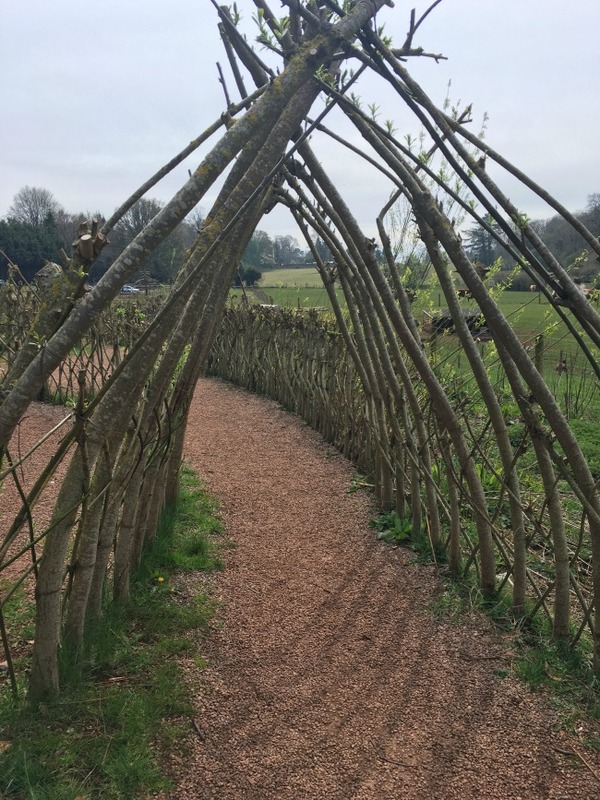 Entrance to the willow maze next to the playground. We had a fantastic time, we spent over an hour walking through the magical wood. We met people who had come from as far as Israel and London to see this lovely place. We could have stayed longer but Bears little legs were tired and because he had missed his morning nap he was struggling to keep his eyes open. 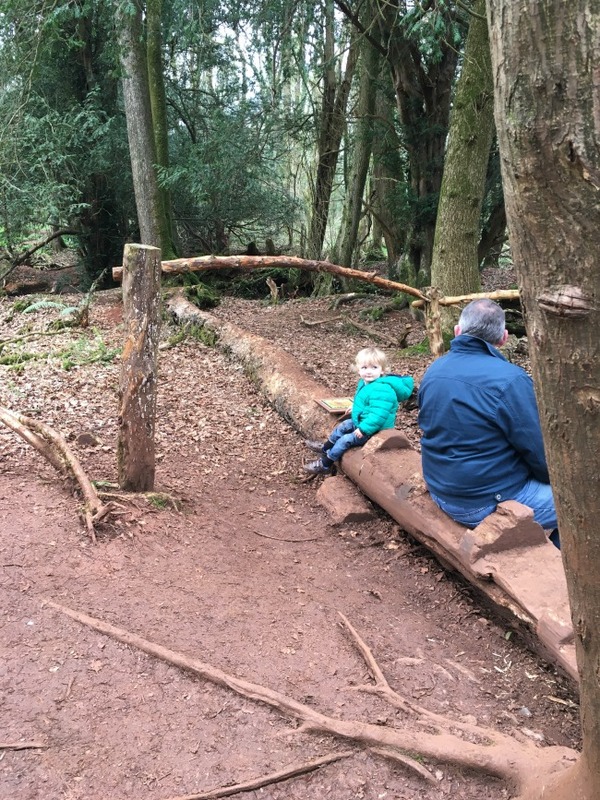 Grandad and I loved that there was lots and lots of seating around the play areas and picnic sites. There was also lots of mud so we were pleased that we had worn sturdy walking shoes, don't come in flimsy sandals! If it is very windy then the site has to close so please check before travelling. Entrance is £6.50 adults £5.50 children, toddlers 2 and under are free. Check their website for opening times and family deals. Just across the road is Perrygrove Railway and if you come on a Tuesday or the weekend you could easily visit both on the same day. We visited on a Thursday so will save the train for another time. The only thing I would change? Just a little sunshine would have made a wonderful day perfect. 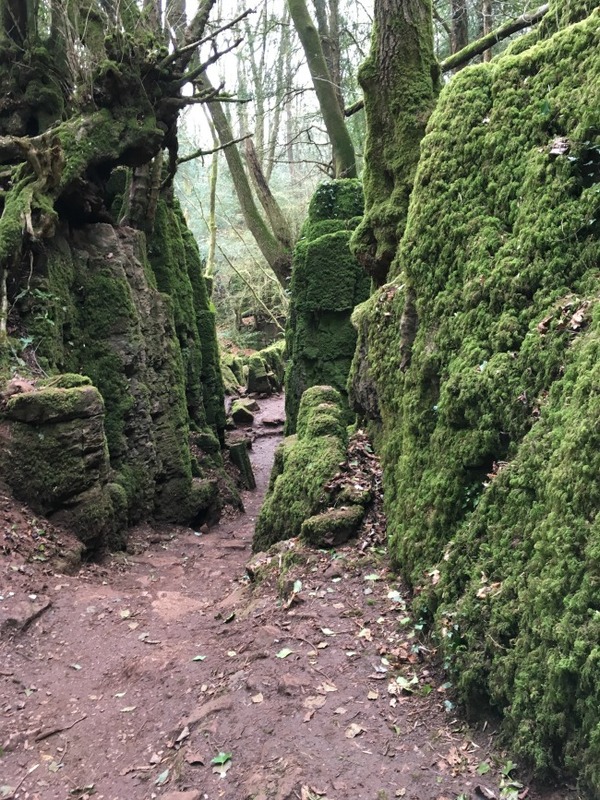 Have you been to Puzzlewood? What was your favourite bit? *we were given free entry for the purpose of a review. All opinions are honest and my own. 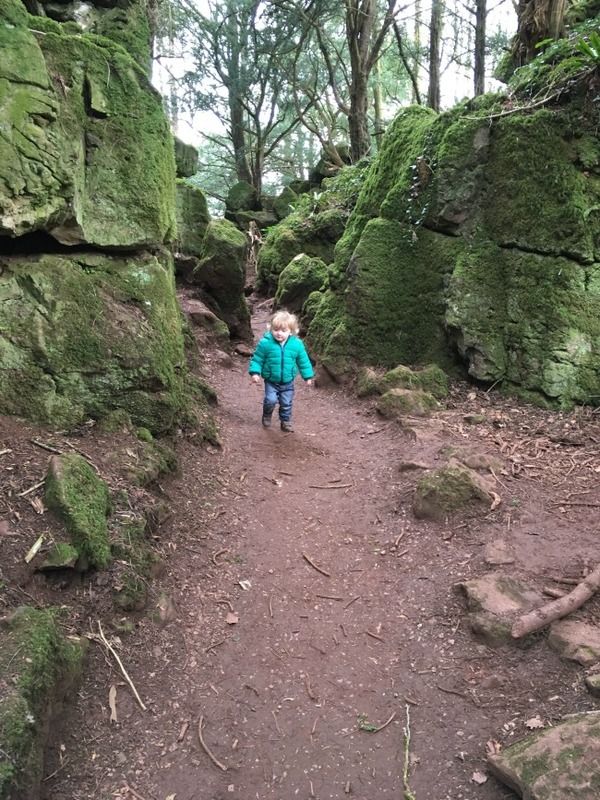 I'd love to visit the forest of dean - heard such good things about it! It's a lovely place to visit. Railways, cycle routes, hiking. 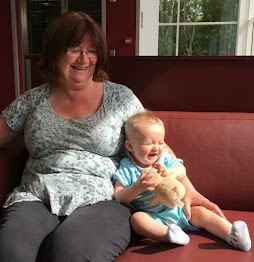 We used to visit lots and now we are doing it all again with our Grandson. The crocodile seat was such fun. We didn't realise it bounced until Grandad sat on it! It's amazing what can be done with a fallen tree. 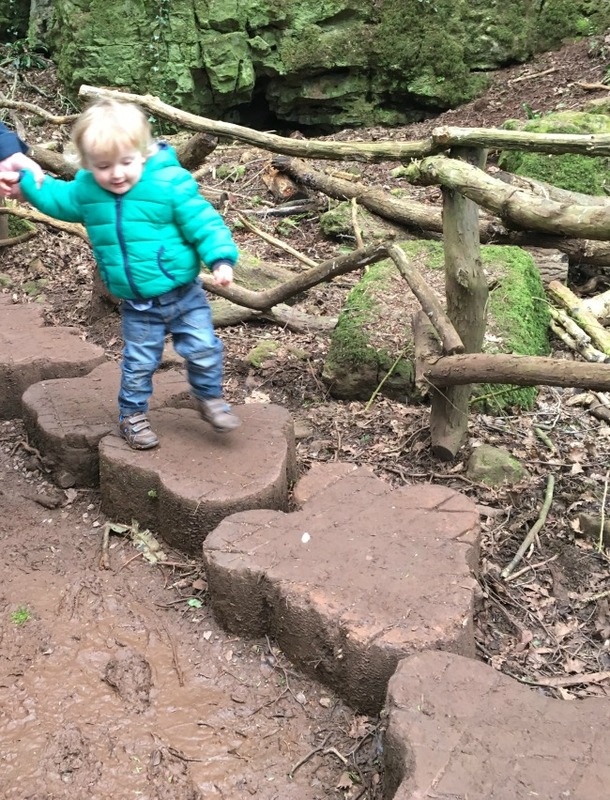 Bear loved the dinosaur footprints, we walked over them, and back and over them and back Lol Very practical too as it kept us out of the mud. We had a great time, it was just a little chilly for the perfect picnic. Oh you must! It is really worth a visit. What a lovely place to go and spend time having fun outdoors. yiur little one looks like he is having lots of fun. Its a great place for toddlers. We loved it. It's all so beautiful. I'd love to see it in the summer too. Absolutely, it was just peeking out from the clouds as we left! What a fun day out, looks like you all had fun.